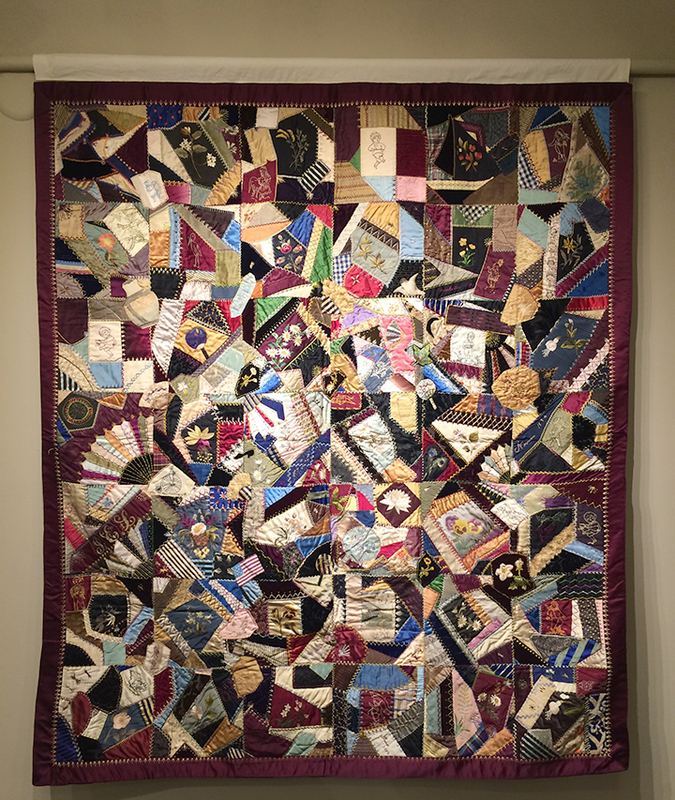 The most recent exhibition at Historic Northampton, curated by Ester White, brings attention to a unique object in their collection, a quilt made in 1884. The quilt, made by Henrietta Lambie (1852-1932), is a truly extraordinary example of the late 19th century American fad of crazy quilting. This style of quilting employs the use of scrap fabric, painting, applique, and embroidery to create these lively furnishings. Although the vibrant colors and playful imagery found in this quilt can be read as signifiers as joy and creation, this quilt is actually a memorial for the loss of Henrietta Lambie’s two young daughters. Henrietta Bryan Lambie, mourning quilt, 1884. Installation at Historical Northampton Museum. The exhibition comprises of six works, including the quilt. The other contemporary pieces were made by local artists in response to Lambie’s work. Each takes up the themes of grief, loss, and women’s health using textiles. Kat Howard’s piece The Topography of Bound Grief reflects the restrictions placed upon women’s bodies in the 19th century, and in the present. The woven wall hanging is a black mass made up of yarn, human hair, sonograms, veil netting, and other scraps of fabrics. The piece produces a visceral experience, which evokes the struggles women have faced throughout the centuries, from political oppression to reproductive justice. Another piece by Lucy Trainor focuses on the domestic mourning practices of the Victorian era. In her work Mend, Trainor illustrates the meditative tedium of hand quilting by meticulously stitching a small, white piece of silk with white thread. The neutral colors of the piece require the viewer to pay close attention to an aspect of quilting that seems mundane, but is actually the basis of the craft. These pieces, along with the others, beautifully echo the organizing object and create a cohesive and compelling show. The notion of “keeping busy” mirrors the actions of a woman in the 19th century coping with her devastating loss. The labor-intensive nature of quilting illustrates the time it took her to mourn her children. Additionally, its elaborateness demonstrates the mindful care Henrietta put into making this piece that memorializes her two girls. The potency of this object lies in its causality and reception. The fact that it was made over 100 years ago by a mother reflecting on her loss is beautiful in itself. What’s more is how her grief can still be communicated to a contemporary audience. The detail of the piece draws the viewer in and allows them to contemplate and meditate on the act of grieving. Grief as an emotion is often pushed aside in present-day society; we all have other engagements that take president, such as careers or schoolwork. These distractions keep us busy, but often in these cases the meditative aspect is lost. However, in the Victorian era, when upper middle class women were often bound to the home, one of the only means of keeping busy was through handicraft. In taking up these projects women were able not only to keep their mind and hands busy while mourning, but to reflect and ruminate on their grief. Henrietta’s quilt not only illustrates the grief felt by a mother, but also her acceptance of their passing. Overall, this exhibition perfectly models both the beauty and tragedy that come from loss. Keeping Busy: Five Artists Respond to Henrietta Lambie’s Mourning Quilt, c. 1884 was on view at the Historic Northampton Museum from February 12—March 6, 2016. View the catalog here. Ivy Vance 13F is a Research Assistant at the Institute for Curatorial Practice. This post is part of a series of essays, opinions, and reviews written by students, faculty, and staff of the Institute for Curatorial Practice.